Experience Wedding Chapel Row; maybe you’ll get a glimpse of Elvis! No children under 18 mos. permitted on tour. 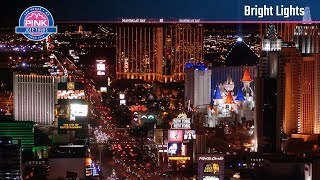 Las Vegas comes alive after dark, and we will show you all the most historic, impressive and quirky sights in the city. Your Certified Interpretive Guide will pick you up at your hotel, ready to party with tunes and trivia. Get comfortable in an open-air Pink® Jeep® Wrangler, where you’ll have an unobstructed view of the Vegas glitz and glamour. Start the evening with a visit to the “Welcome to Fabulous Las Vegas” sign; pose for photos in front of the iconic landmark in all its neon glory. Famous the world over and visible in countless TV and film scenes, this classic piece of Americana is even on the State Register of Historic Places. Las Vegas’s numerous wedding chapels are notorious for off-the-wall ceremonies. Keep your eyes peeled as you cruise Wedding Chapel Row; you’ll undoubtedly see couples celebrating their big day. There are a many reasons Las Vegas is the Marriage Capital of the World, and your guide will have any answers to your questions. Next up on the list of must-see Vegas landmarks: Fremont Street. What started as the city’s first paved street has become the “Glitter Gulch.” This stop will wow you with 12 million LEDs flashing under a four-block-long canopy, complete with zip liners flying overhead. Your guide will explain Fremont Street’s history and urban legends, and outline the many movies, music videos and TV shows it stars in. Your guide is both a local and a trained expert in all things Vegas and will narrate the architectural details and trivia of famous hotels and resorts as you explore the city. You’ll see the gleaming exteriors of the Venetian, Caesars Palace, Mandalay Bay, Mirage, Aria, Wynn and Paris Las Vegas. The night is yours after you guide drops you off at your hotel. What will you do after dark in the Entertainment Capital of the World? Ask your guide for personal recommendations that make the most of your time in America’s Entertainment Capital. Let me start off by saying that this my first review i am ever writing! I am in my late 60s and retired 3 years, my lady and i do a fair of amount of travel. When we retired we made up a bucket list, see the grand kids back east also to see as many national parks as we could. Have been to 19 so far MANY tours also. Two days ago we did a Pink Jeep tour at nite down the Las Vegas strip uptown downtown all over. I just wanted to say this one of the best tours we ever took! Open air jeep, our guide Jim C just impeccable, made you feel like family, just a good guy you can see he loves his work. The odd thing about this we have seen all of what we saw on our tour,live here 20 plus years! They just showed us in a different light,so if your visiting or a local, hook up with these guys thank you to all at Pink Jeep! Wonderful time! Our guide was funny and entertaining and in tune with everyone’s desires! It couldn't have been better, the vehicle let's you really take in the experience: the smells, the sounds, the sights. The guides make you feel like friends visiting their home town. It's an evening out in Vegas that you won't forget and won't empty your wallet. It was great! Tim was lively and so much fun to talk to. We were very impressed! This tour is recommended for everyone who does not just come to Las Vegas to play. During the tour we got to know many interesting places, and From Ken, our tour guide, we have learned many interesting things about Las Vegas. I do not want to miss this experience. We both had a great time and would highly recommend it to anyone. Jerry ,our guide is perfect for the tour.